End of your arm: What's a Maclean's? 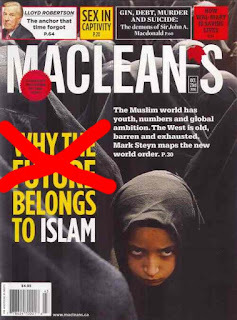 Kathy has a very good post up now about how Maclean's has gone from being at the front line of defending the press, Canadian society in general and Mark Steyn in particular, to being a snotty, Islamophiliac rag that my tax dollars unfortunately support. If Maclean's and all its writers are so great, why do they need to be subsidized by the taxpayer? Maclean's is basically the same as the CBC, Margaret Atwood, etc..mediocre to truly crappy Canadian "talent" propped up by orgasmic, preening liberals and the taxpayer's wallet. When Mark Steyn was forced to write a "clarification", that's actually when I knew a) he would never write another word for them again and b) that it was the beginning of the end of the magazine. This article on the SCARY RIGHT WING BOOGEY MONSTERS oozes Jew-hatred and dhimmitude. Disgusting. Justin Trudeau is vapid and stupid. Not all Muslims are terrorists, but most terrorists are Muslims. 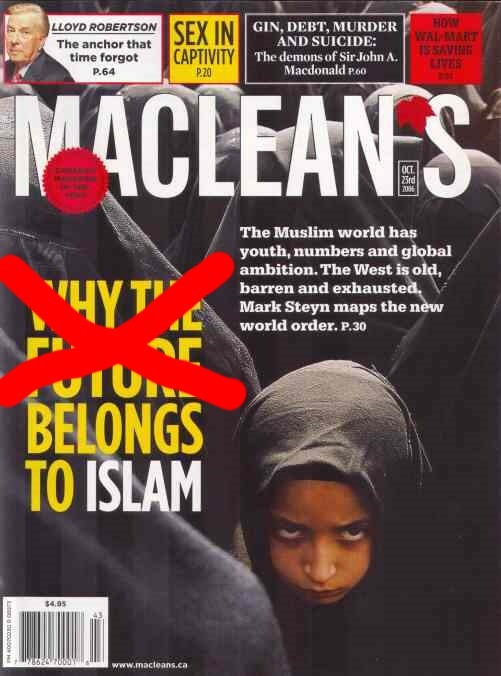 And Maclean's virtue signalling will not be an inoculation against terrorism, despite its wet dreams to the contrary.